People are playing League of Legends right now. Millions of people . From May 8 to May 11, though, the best players in the world are going to be playing League of Legends in the All-Star 2014 tournament, and millions of people are going to be watching. But how will you watch? Where will you watch? Riot's put together a handy list of who's competing and when. Here's the coolest thing about this year's All-Star Challenge, which precedes the tournament: fans voted on which pro League players get to compete. You can find the full schedule for the tournament on the League of Legends website . Every morning (Paris time) before the Invitational kicks off, two fan-picked teams dubbed Fire and Ice will compete in the All-Star Challenge's four different modes: 1v1, U.R.F. , Hexakill , and the Pick 10 . The international super squads will be facing off in teams of six (dare we hope for an actual hexakill? ), playing the champions that fans picked, dueling one on one, and causing all kinds of chaos in the April Fools Ultra Rapid Fire mode . 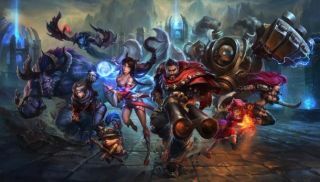 Riot is showing off its goofy side, and the All-Star Challenge will offer a rare opportunity to see how pro players perform outside their comfort zones and usual teams. Will the teams fall victim to language barriers? Heated rivalries? The irresistible draw of the Paris nightlife? With luck, the All-Star Challenge will be a gloriously messy sideshow for the Invitational. Check out the LoL eSports website from May 8 to 11 to catch livestreams of the 2014 All-Star extravaganza.